Find your new home in Kingdom Heights! Located just north of Rosenberg on FM 723, Kingdom Heights is a premier master planned community with 150 acres of parks and lakes. 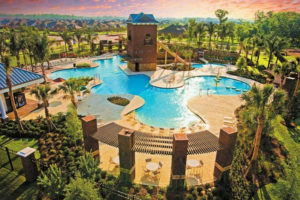 The community was carefully designed to be unique in Fort Bend County and offer affordable living with outstanding amenities. Most home sites in Kingdom Heights are built on a lake or park. This provides comfortable space throughout the community with room for families to grow and play. Walking throughout the community will lead you to several parks and large lakes for fishing from the shore or canoe. Amenities in Kingdom Heights are extraordinary for an affordable location. The large Recreation Center has a full kitchen and a large area for hosting parties indoor or on the patio by the pool. The Fitness Center is a fully equipped gym for residents with a convenient look out to a playground for the kids. Other amenities include a resort style pool, sport fields and more! Kingdom Heights offers new homes from three reputable builders; K. Hovnanian, Saratoga Homes, and Gateway Homes. New homes in the newest Section 4 are single-family homes starting from $240,000+ with low taxes. There are three beautiful model homes to visit located next to the recreation center. With a new home in Kingdom Heights, you’ll be able to enjoy over 67 acres dedicated to parks. Rosenberg is just 30 minutes from Houston with easy commutes to the Energy Corridor, downtown Houston, Sugar Land and Katy. Kingdom Heights is just minutes from Hwy 59 and Westpark Tollway/FM 1093. Kingdom Heights is zoned to LCISD’s Foster High School just 2 miles from Kingdom Heights. If you are looking for value and want to live in a unique, family friendly Fort Bend County Master Planned Community, Kingdom Heights is without equal. Follow Kingdom Heights on Facebook to keep up with their latest events and happenings.